Combine almond meal, coconut flour, coconut, coconut oil, milk and egg in a bowl to form a dough. Line a pie dish and press the pastry into the dish. Bake at moderate heat for 15mins or until golden brown. Allow to cool completely. Meanwhile, prepare the filling. Heat 200mL of cream for 1-2mins in a microwave, until small bubbles start to form on the outside. Then add in 200g dark chocolate, allow to sit for 5mins. Add in 1 tsp vanilla and whisk the chocolate cream mixture. Pour chocolate into the pie crust. Place in fridge to set for 2-4 hrs. Whip remaining 100mL of cream until soft peaks form (about 10mins). 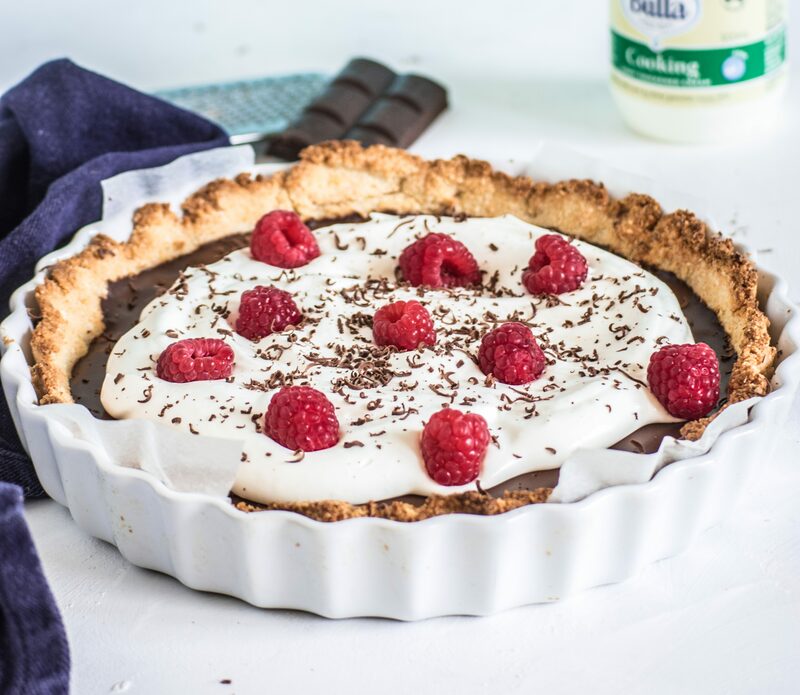 Then spread it over the chocolate pie, grate extra chocolate on top and finish with fresh raspberries!